In times past, my philosophy was simple. ….If plants can’t hang in nature, then bye-bye plants. I am a naturalist. I don’t play around with plants that aren’t suitable for my area. Recently, weather patterns are beginning to change and it seems like our area is experiencing more surprise freezes. My philosophy has started to change. We have experienced a ridiculous amount of freezes this year in Texas. It’s cold. I really don’t think I was this cold when I lived in Montana!!! Then, I blink my eyes, and it is 70 degrees again. Then, the bulbs think it is Spring and I blink again…..another freeze. The poor spring bulbs are so confused! To flower or not to flower…….that is the real question! The last freeze wiped out all of my Paperwhites. The surprise freeze also wiped out some fall bulbs I had recently dug up. I am not an angry person until I lose flowers…..then it becomes weather war! Tonight, we will have yet another freeze. I have more Paperwhites blooming. 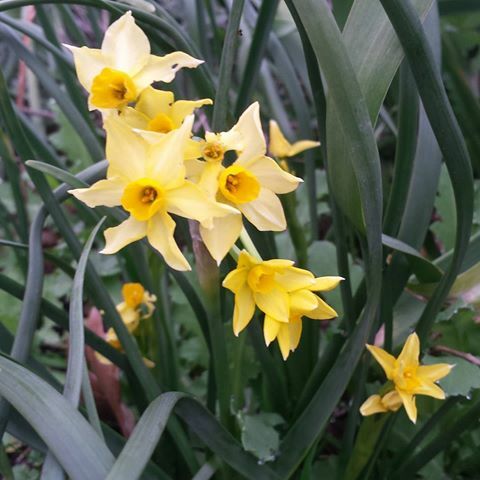 Daffodils, Hyacinth and other spring loving bulbs beginning to peak their flowering heads out of their foliage. The freeze tonight will kill the beautiful flowers I’ve waited all year to see. I literally have been sulking around all day….until I changed my attitude and philosophy. I covered up the budding flowers. I’m simply NOT going to miss my Spring Bloom just because of a dumb little freeze! I placed large plastic pots around the blooms, being careful not to break or squash the flower. A freeze will not kill the bulb, but it will damage a bud.